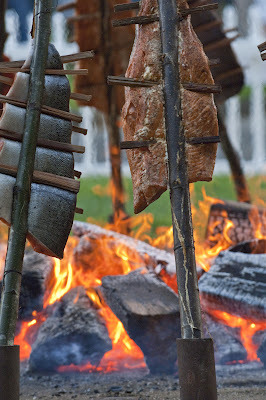 This barbecue technique was not limited to the American South, for tribes in the Pacific Northwest have long used the same approach to cook salmon. Sometimes the salmon was hung above an alder or cedar wood fire, and other times the fish were splayed on a specialized wooden frame that was then angled toward the fire. The cook could adjust the level of heat and smoking by moving the frame closer to or away from the fire. So, the next time you get into a heated discussion with someone about defining authentic barbecue, lay this angle on them.